Our new Program 1054 180° screw-on hinges come in 2D and 3D adjustment types to allow for door re-alignment of specialist cabinets and enclosures or similar access panels. This enables manufacturers to compensate for the inevitable accumulation of tolerances in production of large format doors, or for users wishing to easily adjust for settlement in service. Typical applications include large industrial control cabinets, HVAC systems and screens. 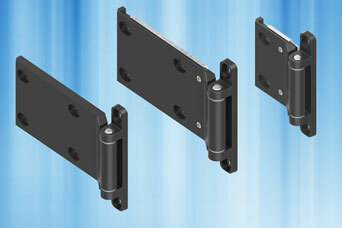 The large door flap design of these zinc die black powder coated hinges provides a load spreading and strengthening function on large flush mounted doors which typically are constructed with as thin a gauge material as possible so as to keep their weight to a minimum – and so require large area mounting plates. Share the post "New 180° hinges adjust in 2 or 3 dimensions"